Let’s face it: every year when we wrap gifts, we want it to be quick and easy since there are so many to wrap. At the same time, we want each present to feel special… or extra special depending on the recipient. Sure, you can buy ready-made bows and curled ribbon, but here we’ll show you how to make some simple embellishments that will knock your gift wrapping out of the park. You can even make these in advance so your stash is full when it comes time to wrap gifts. Hot glue mini pinecones, artificial greenery, and gold leaves onto a wrapped box. (The “leaves” are actually petals from a gold poinsettia!) We collected several pinecones from outside, but you can replace with whatever you like. Craft stores carry all kinds of fun knick-knacks for embellishing—from miniature presents to little birds. 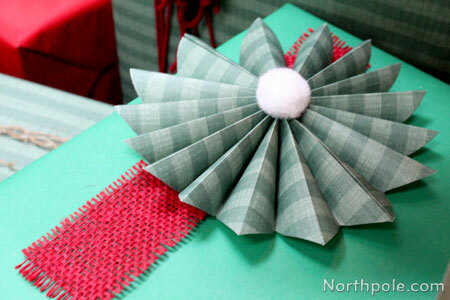 For this present, cut scallops around a plain sheet of paper, glue the paper on top of a box wrapped in red wrapping paper, and then glue candy canes on top. If desired, tie the candy canes with yarn before gluing them to the box. As a finishing touch, you can hand-write “To:” and “From:” on the paper. We like to use twine because it is so versatile. Its earthy, rustic texture complements neutral colored wrapping paper, but you can also use it to break up the color of a really bold package. (Teal, fuchsia, or gold would look great with twine!) You can wrap gifts with twine straight from the spool or separate the strands to get some wavy pieces of twine. This “bow” is an enlarged version of our Fluffy Tissue Paper Flowers. 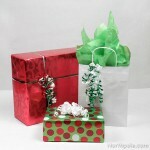 To make your bow the right size for your gift, cut strips of tissue paper that are 1" shorter than the width of the box. (Length doesn’t matter since you will be folding it!) As you follow these instructions, make following changes: After folding the paper like an accordion, round off the ends. Instead of floral wire, use a pipe cleaner to tie the bow. Form a loop with the pipe cleaner, then simply put a piece of tape through the pipe cleaner loop and stick onto your present. Wrap yarn around the package a few times and tie off the ends. Make a couple yarn pompoms without trimming the ends, which will give them a perfectly imperfect look. Use the longest piece of yarn on the pompom (the string that you used to tie the pompom together) to tie onto yarn on the package. After wrapping the other presents, we had some odd-shaped pieces of wrapping paper left over. Instead of throwing those scraps away, we used them to make paper stars. Click here for directions.